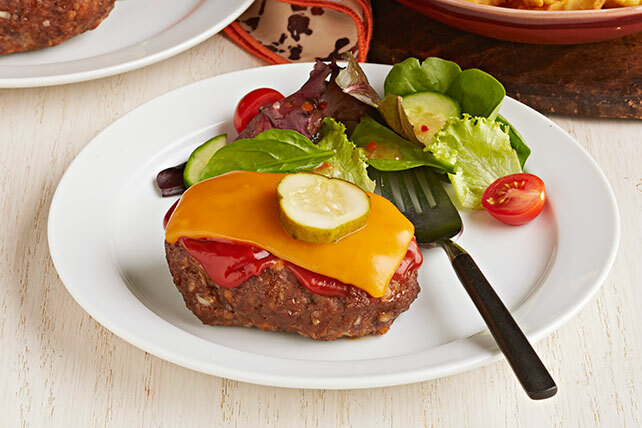 Make mini cheeseburgers without a grill by cooking our Mini Cheeseburger Meatloaves. You can even make these mini cheeseburgers ahead of mealtime! Mix meat, cracker crumbs, onions, eggs, mustard, Worcestershire sauce and 1/4 cup ketchup just until blended. Cover rimmed baking sheet with foil; spray with cooking spray. Shape meat mixture into 8 small loaves; place on prepared baking sheet. Bake 30 to 35 min. or until done (160°F), topping with remaining ketchup and cheese after 20 min. Top with pickles before serving. Prepare and bake meatloaves as directed, but do not top with remaining ketchup and cheese. Cool completely, then wrap individually in foil; freeze up to 2 months. When ready to serve, thaw overnight in refrigerator. Reheat in 375ºF oven 22 to 25 min. or until heated through, topping with remaining ketchup and cheese after 20 min. Or, place 2 thawed meatloaves on microwaveable plate. Microwave on HIGH 2 min. or until heated through, topping with remaining ketchup and cheese after 1-1/2 min. Top with pickles.